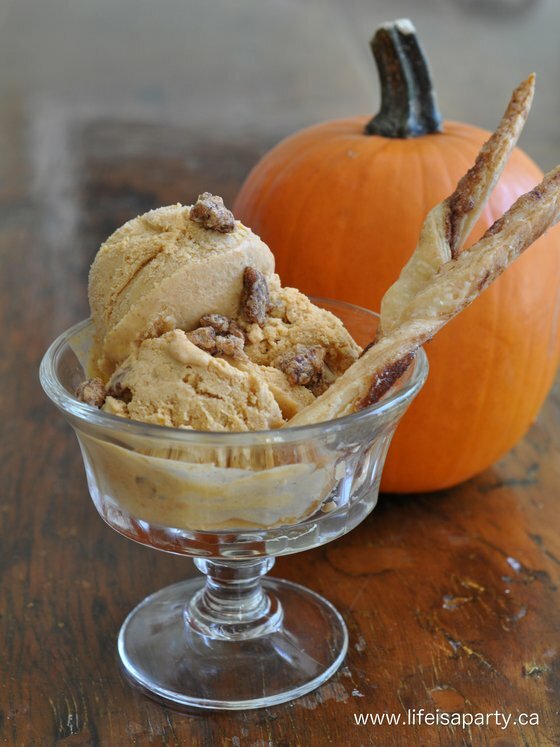 With warm fall afternoons upon us, Pumpkin Pie Ice Cream is the perfect treat, it combines the sweet fall flavours of Pumpkin Pie with the refreshing summer treat of ice cream. I’ve made pumpkin ice cream once before, and remember thinking it was just okay, and I’d rather have pie. This time I added candied pecans, for the perfect sweet crunch, and a pastry cinnamon stick for the perfect pie-like addition. I’m in love with this recipe. 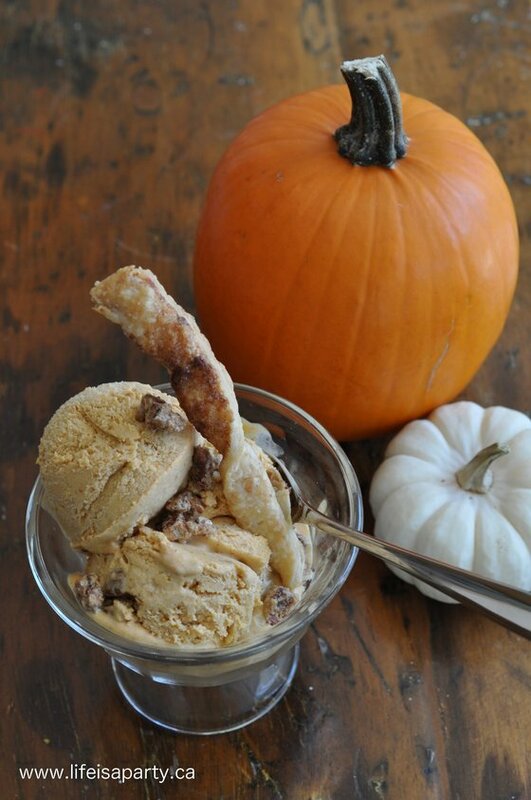 If you’re a fan of pumpkin pie, this is the perfect pre-thanksgiving treat to try. There are several steps, but it can all be made ahead -think the perfect early fall dinner party dessert! I really think your going to like this one. 1. In a stand mixer on low speed combine the milk, and brown sugar, until the sugar is dissolved, about 1 to 2 minutes. Stir in the pumpkin purée, cinnamon, ginger, and nutmeg. Add heavy cream and vanilla, and mix until combined -making sure not to over the mix the heavy cream so it doesn’t begin to whip. 2. Turn the ice cream machine on; pour the mixture into freezer bowl, and let mix until thickened, about 20 to 25 minutes. Add the candied pecans during the last 5 minutes of mixing. The ice cream will have a soft, creamy texture. If a firmer consistency is desired, transfer the ice cream to an airtight container and place in freezer for about 2 hours. 2. Whip egg white slightly until frothy. Stir in pecans to coat. Sprinkle with sugar and cinnamon. Stir to combine. 3. Spread out pecans in a single layer on a cookie sheet, and place in oven, stirring every 15 min. for 1 hour, until pecans are dried and toasted. Let cool before adding to ice cream mixture. Reserve some to sprinkle over each at serving time, if you wish. Make your favourite pastry -enough for one double crust pie, or use frozen pastry. Roll out and spread with a thin layer of softened butter. Sprinkle the dough with white sugar and cinnamon. Cut into long strips, about 1/2 inch wide. Twist several times, and cook on a cookie sheet for around 15 min. at 400, or according to the pastry recipe. 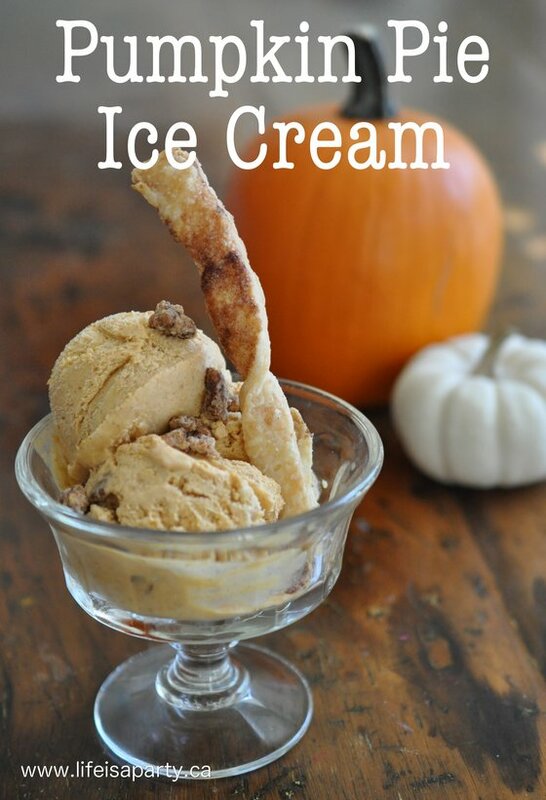 To serve, sprinkle each serving of ice cream with extra candied pecans, and add a pastry cinnamon twist. This is one of those dangerous recipes, that you keep thinking about and wondering if it’s dessert time again yet. 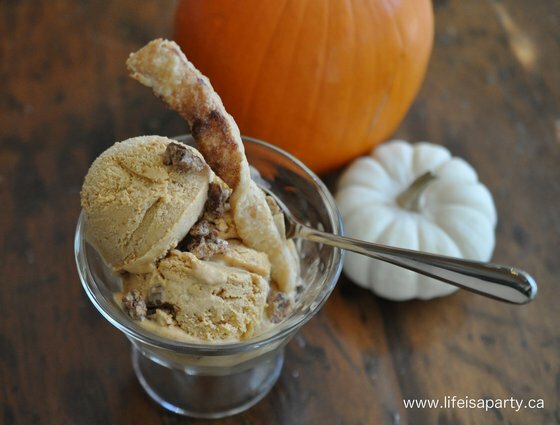 With pumpkin pie ice cream in your freezer, life really is a party! Enjoy! This post is linked up at Link Party Palooza at Tatertots and Jello, French Country Cottage, Monday Funday Link Party, and The 36th Avenue.